2 Salmon, 2 Tuna, 2 Seabass, 2 Prawn nigiri, 8 Rainbow roll, 5 California roll, 5 Spicy Salmon roll. 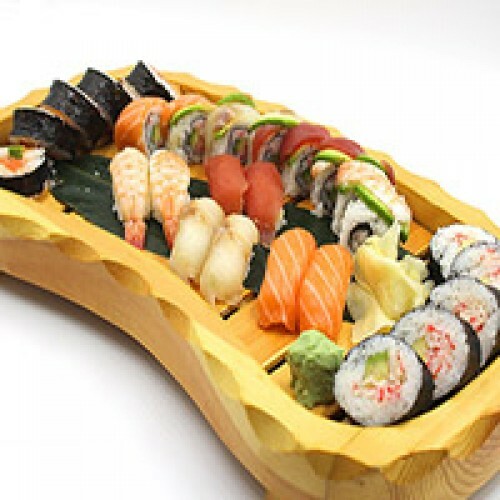 15 pcs of 5 kinds of assorted sashimi (Chef’s Choice) ..
Sushi Set 2 (34 pcs) 2 Salmon, 2 Tuna, 2 Seabass ,2 Prawn nigiri, 5 California roll, 5 spicy Salm..
Sushi Set 1 (17 pcs) 1 Salmon, 1 Tuna, 1 Seabass, 1 Prawn nigiri, 5 California roll, 4 Salmon, 4 ..
Sushi Deluxe Set 2 (70 pcs) 8 Devil Eyes roll, 8 Dragon roll, 8 Salmon Fusion roll. ​ ..